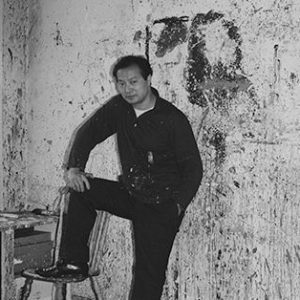 Born in Wuxi, China in 1929, but raised in Shanghai, Walesse Ting is a self-taught painter, sculptor, graphic artist, and poet who began his life as an artist at a very young age, painting on sidewalks. He left China in 1949 and settled for a six year period in Paris beginning in 1952, where he lived as a poor struggling artist but became acquainted with artists Karel Appel, Asger Jorn, and Pierre Alechinsky, members of the avant-garde group called COBRA. His fortunes changed when he moved to New York in 1960, where he became involved with pop artists and was influenced buy Abstract Expressionism. Concentrating briefly with abstract techniques, he soon adopted a representational manner which he is continually expanding. Now, the colorful and flamboyant works of the painter Walasse Ting are among the most admired examples of popular figuratism. Ting’s works are a unique blend of bright fluorescent colors infused by an appreciation for the sensory pleasure of the natural world. Besides painting, Ting has worked on numerous other projects, among them creative direction for theatre, teaching and lecturing. He has also authored a number of books of poetry, the foremost being Red Mouth, containing reproductions of 428 paintings and 33 black and white drawings. Walasse Ting was presented the Guggenheim Fellowship Award for Drawing in 1970. Public collections which own his work include the Stedelijk Museum, Amsterdam; the Silkeborg Museum, Denmark; the Museum of Hong Kong; the Chicago Art Institute; and the Musee Cernuschi, Paris. Ting has had more than 60 solo exhibitions in major art galleries and museums around the world. After more than 20 years in New York, Ting moved to Amsterdam, where he has a spacious studio. Although he broke away from his Chinese roots so long ago, he finds that the city’s trees and canals remind him of Hangzhou’s West Lake. 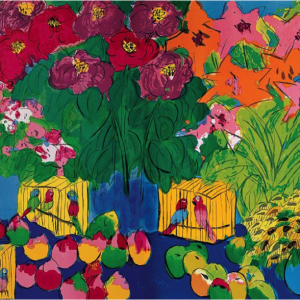 Today he lives in both New York and Amsterdam, but like Gauguin, he also often visits Tahiti in search of the exotic colours that he loves.